The 2018 edition of the CONCACAF Champions League, the club competition involving teams from North and Central America, was the first to try a new format. Previously, the competition began with a group stage and took nearly 8 months to complete. From this year, however, 16 clubs would play a knockout tournament starting in February and lasting just two months. Five MLS sides qualified, including Toronto FC, who were Canadian champions in both 2016 and 2017. 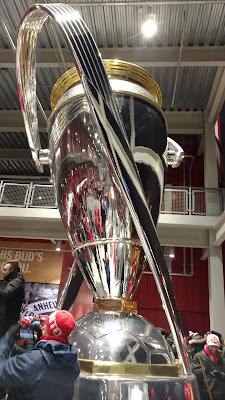 Interestingly, their MLS title would not have garnered them admission to the tournament as the league is considered American for continental competition purposes. Four Liga MX teams joined the party, along with six Central American clubs and another from the Dominican Republic, all essentially acting as fodder. The first round saw all four Mexican clubs advance, along with three MLS representatives. Colorado were dispatched by Toronto, so at least it wasn't a humiliation for the Rapids. FC Dallas could not say the same after losing to Panamanian participant Tauro. The second round saw the four Mexican clubs in separate ties, and most watchers expected them to sweep. 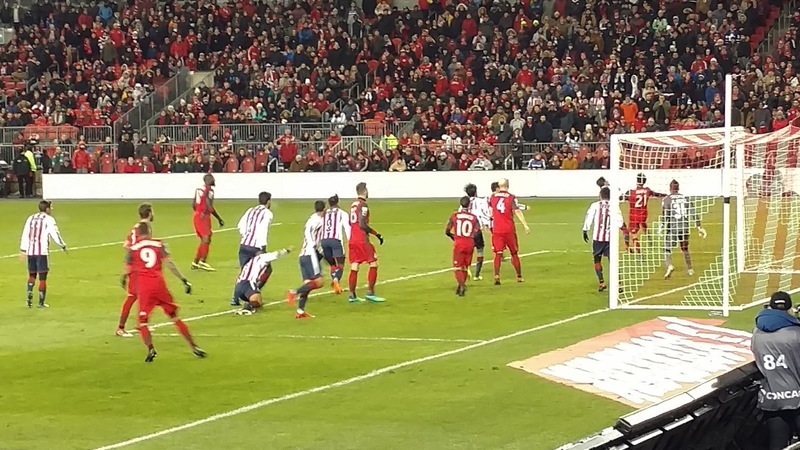 But both TFC and New York Red Bulls surprised their Liga MX opponents, while Chivas Guadalajara and Club America saved Mexican pride. MLS sides have fared poorly in recent years with all nine previous champions coming from Mexico, so this was certainly a result worth paying attention to. 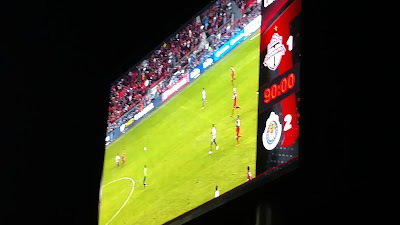 When TFC beat Club America 3-1 at home in the first leg of the semifinal and the Red Bulls lost 1-0 at Chivas Guadalajara, MLS fans started thinking an all-MLS final was possible. Unfortunately, the Red Bulls could not score at home and fell 1-0 on aggregate, but TFC drew 1-1 in Mexico City and advanced to the final. 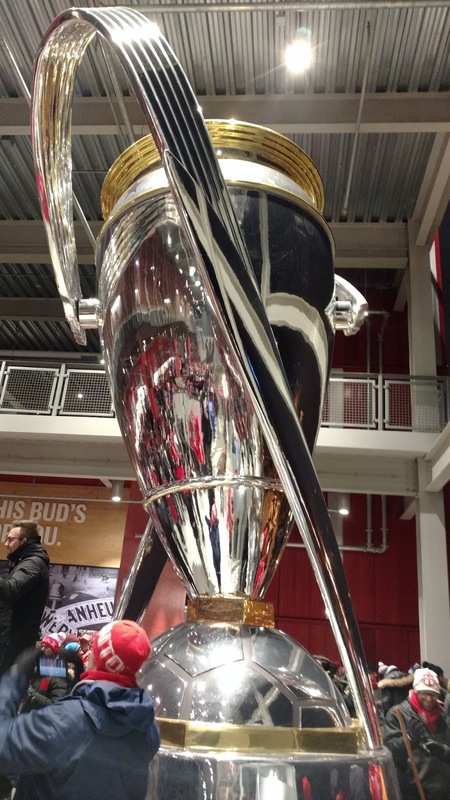 Above is a giant replica of the actual trophy that would be awarded. 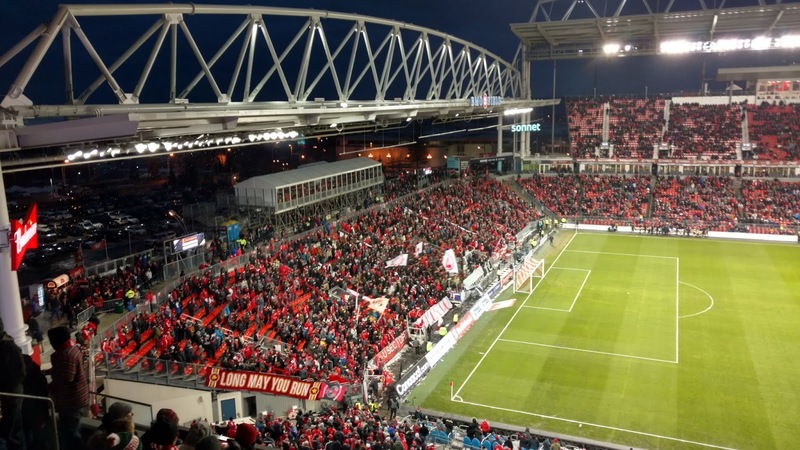 As TFC had a slightly worse record in the competition up until then, they had to host the first leg, which was set for Tuesday night. I was particularly happy with this turn of events because I would be in nearby Belleville around that time and made my way to Toronto to see the game. My brother is a season-ticket holder and was able to get me a good seat (view above) for a reduced price. After watching the Jays win the opener of their doubleheader against the Royals, I took a streetcar over to BMO Field, which was packed for the match. Security was tight and there were long lines at the main gate, so I walked around to the back to save a bit of time. I made it to my seat in time for kickoff, which was set for 8:15. I was surprised to see a Mexican fan next to me as usually away supporters are seated separately to reduce the chances of violence. Toronto is a peaceful town though, so there were no concerns here. It took a few minutes for the ceremonies to complete, and the match started at half past the hour. 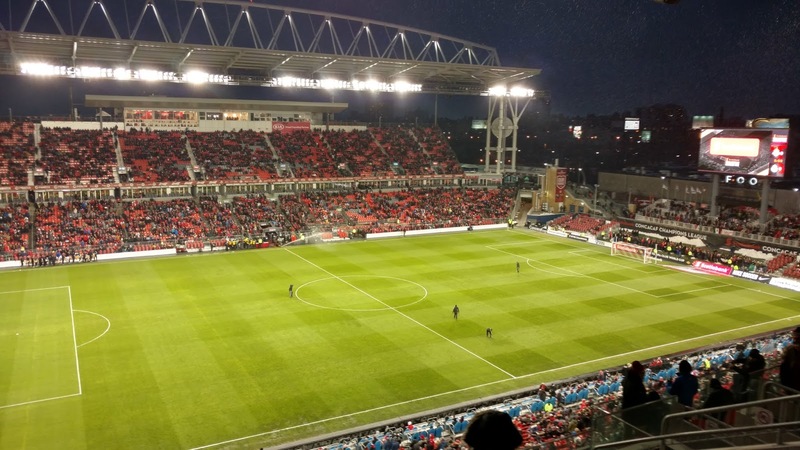 With snow falling and temperatures just below freezing, home fans hoped that the weather would affect the Mexicans, but it was TFC that came out cold. A defensive lapse led to an open Rodolfo Pizzaro who slotted home just over a minute in. Toronto native Jonathan Osorio tied the match in the 19th minute and the rest of the half was scoreless. During the break, I left my seat and braved the crush of fans along the concourses in order to get a different view. I ended up downstairs and took a picture from a seat there (above) before moving on. I ended up standing just above the corner flag next to the goal that TFC was attacking and spent the second half there. 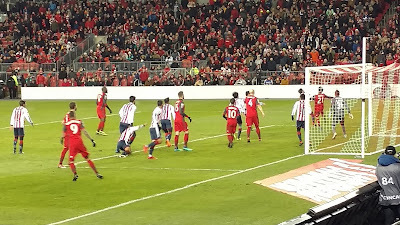 Toronto had plenty of chances but it was an unlikely free kick from Chivas striker Alan Pulido that beat TFC keeper Bono and gave the Mexican side another critical away goal in the 72nd minute. TFC pressed but could not find an equalizer and the match ended 2-1 in favour of the visitors. 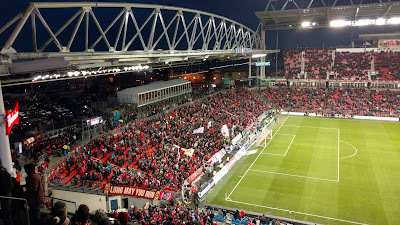 A disappointing finish, but there was still the return match to consider, so TFC was not out of it yet. 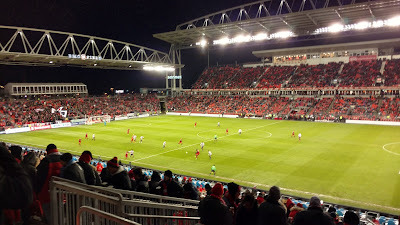 The second leg was played the following Wednesday and TFC needed to win by 2 goals, or score at least 3 away goals. In the end, they won by an identical 2-1 score, which led to penalty kicks, with no extra time in between. Chivas clinically scored all 4 of their chances, while Osorio and Michael Bradley missed for Toronto, so yet again, a Mexican side is traveling to the Club World Cup in December. That free kick goal in the first leg was really the difference. Toronto's MLS campaign has suffered due to the tough CCL schedule, which saw them make 3 separate trips to Mexico. Through 6 games, they are 1-1-4 and sit last in the Eastern Conference. They still have 32 games to make up ground, but it would be good if the league could support them by rescheduling matches. It is the league that benefits from a continental championship as well and you would think they would do their best to help the competing teams. I'm off to Minneapolis this week to check out a couple of Jays games as my Toronto on the Road quest continues. After that, I'll take a short trip to upstate New York to watch some Toronto minor leaguers, as the Blue Jays AA team is in Binghamton while the Marlies are in Syracuse for the second round of the playoffs. Later in May, I'll be doing a one-way trip from Orlando with a stop in Augusta to keep my active minor league ballpark membership active. As always, recaps will be posted here eventually.